It’s not so long since I argued that the economy was bringing down concern about the environment (and, err, that article hasn’t exactly been buried in a recent deluge of posts). The data indicated that, across a range of countries, people were becoming less worried about climate change (and other environmental issues) at around the same time that national GDPs were falling. This suggested an explanation for the recent fall in concern about climate change, which was different from those explanations we’ve seen before (like challenges to climate science, or recent cold winters). Intuitively this explanations seems more convincing since it doesn’t assume that people spend much time pontificating about climate change, as the other explanations do. In fact, it essentially assumes the opposite, which is probably reasonable. But the last two climate polls I’ve seen suggest that maybe things have started to change. We’ve already seen that the Guardian’s recent ICM poll found that 83% think that climate change is a threat now or will be in the future – crucially, that’s the same as they found in August ’09. 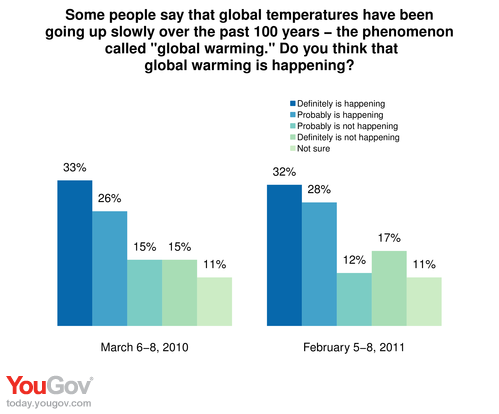 This marked a change from other recent polls, which all seemed to point to some fall in concern about climate change that occurred after August ’09. Perhaps opinion had indeed started to shift. Or alternatively that poll could have been an outlier. Without another poll to back it up, it was hard to tell (this is of course the problem for media outlets when they’re reporting their own expensively bought poll: any single poll can be an outlier, and indeed the more exciting and headline-friendly a poll is, the more likely it is to be an outlier. Sites like 538 and UK Polling Report, which report polls from across the firms, are a good way of sense-checking any individual poll). I haven’t been able to find the data from the original poll to check that the question orders are comparable – and in fact in the latest poll there’s a preceding question about the recent cold winter, which could be slightly distorting – but at least the question wordings themselves appear to be the same. Now, even two swallows do not a spring make. And note that the polls are looking at changes over different time periods. The US poll is comparing now with a poll taken after concern about climate change fell in most places, while the UK poll compares with a poll taken before that point. But the two polls both suggest that the falls in concern about climate change and in agreement with climate science have at least bottomed out. It’ll be very interesting to see what comes next. This entry was posted on Wednesday, March 2nd, 2011 at 22:05	and is filed under Climate Sock. You can follow any responses to this entry through the RSS 2.0 feed. Both comments and pings are currently closed.